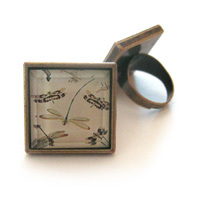 This gorgeous ring features altered art images of dragonflies on a light green/cream background. The image has been printed onto quality paper and sealed under a 25mm flat glass tile with bevelled edges using jewellery grade resin. The glass is then set in an antique bronze coloured adjustable ring setting (lead and nickel free). Ring is adjustable but is not suitable for people with very small fingers. Thank you for visiting my store. I add new items on a regular basis, so if you don't find something you love today, I hope you come back soon for another look!